(NC) – Whether you have a small yard in the suburbs or an acre in the country, your private green space serves as habitat for wildlife – from a variety of native and non-native plants to insects, birds, and other animals. With habitat loss and degradation taking their toll on biological diversity in Canada and around the world, habitats on private lands can play an important role in providing food, shelter, water, and the other necessities to a wide range of species. Restore native plant communities. The wildlife in your area co-evolved with these species, and depends on them for food and shelter. Plant a variety of trees – from fruit and nut-bearing species to evergreens and deciduous trees. Trees provide critical food and shelter for birds and animals. If you have a forested area on your property, leave a few dead or dying trees standing. 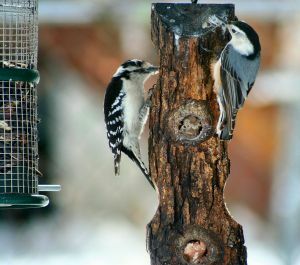 These “snags” provide homes for cavity dwellers, such as chickadees, woodpeckers, and squirrels. Piles of rocks and logs serve as homes for small animals, such as chipmunks and snakes. Use natural week control techniques to eliminate the use of pesticides and other chemicals in your yard. Put up bat houses and birdhouses as shelters, and help control insect pests naturally. Creating an environment friendly to birds, butterflies, bats and other small creatures is increasingly important if we wish to preserve and protect native animal species. Designing your backyard to attract butterflies will also attract such delights as hummingbirds and important pollinators such as bees. See our articles on butterfly gardening, and how to make your own butterfly nectar, for more details. We also have recipes to make your own hummingbird food or oriole nectar, and a free bird house plan, plus birdhouse specifications to help you build the right bird house for the species of birds in your area.